One thing Chris and I miss the most when we travel around the United States for work is the food. I’m not even just talking about Tex-Mex, Fried Chicken, Whataburger and BlueBell ice cream; I’m talking about the produce. Sure places like Ohio and Pennsylvania have some of the freshest homegrown produce you could ask for; in fact we could barely eat all of the free cucumbers and squash the locals would bring to our office to share, but when it came to grocery-bought produce the small towns we find ourselves in are sorely lacking in terms of some of the staples of home cooking: fresh peppers, both spicy and bell, watermelon, pitted and seedless, nice juicy oranges and, most importantly, freestone peaches. 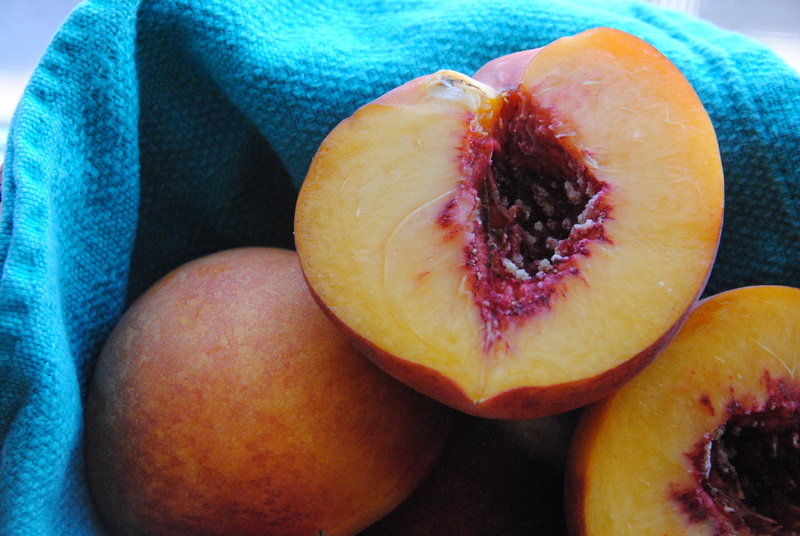 I’m telling you, nowhere in our trek across America could we find peaches that weren’t a complete nightmare to cut open and ‘de-pit.’ Many a fingernail was lost (and found, just to be clear, we never ate fingernails) to a stubborn clingstone peach pit. So, being back in Texas during a wonderfully hot summer for a while, I’m taking advantage and baking all the peach pies, cobblers and crumbles I (and everyone in my family) can possibly stomach. 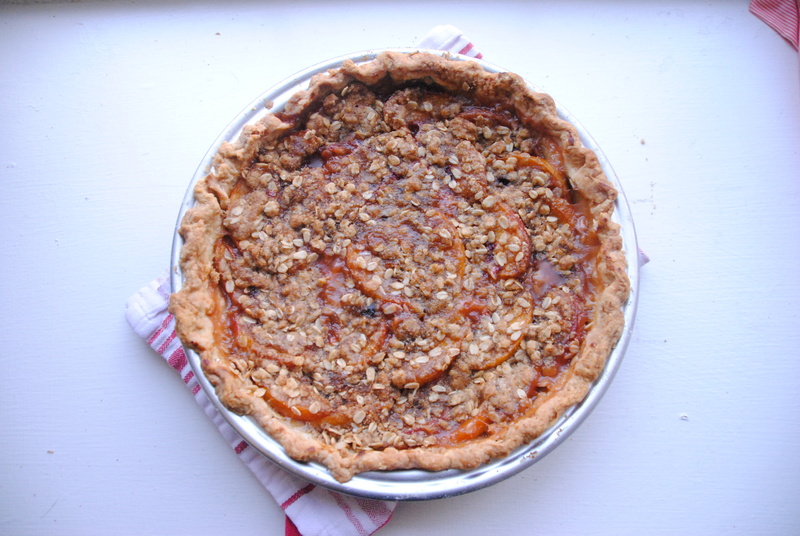 This crumble I found online at MarthaStewart.com, but the crust I used is my favorite recipe; check out my tutorial on crust-creating here. You can also use a store-bought pie dough, but I just know you have a beautiful ready-to-bake homemade pie dough sitting right in your freezer. Oh wait, that’s just me who always has pie dough in her freezer? I kind of have a thing for pie dough. 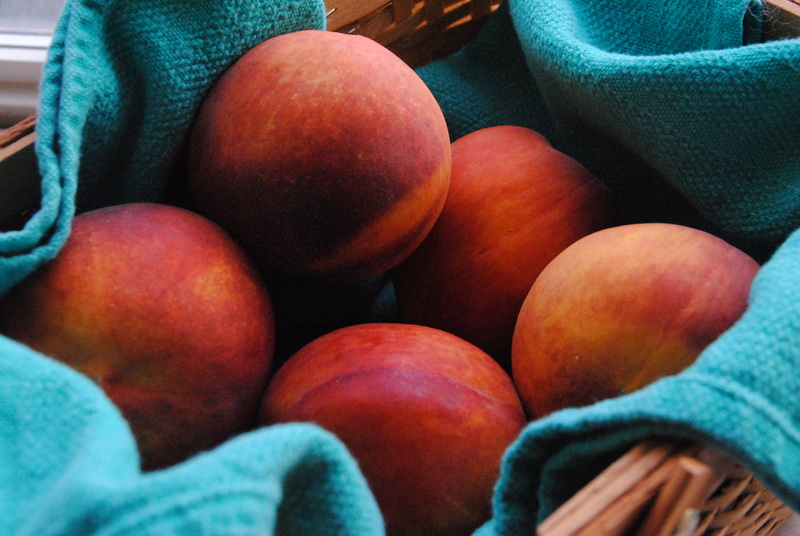 And free-stone peaches. I’m trying to get help. Start by rolling your pie dough out on a lightly floured surface. To make sure you roll it out to the correct size simply take your pie pan, turn it upside-down and hover it over your pie dough. Once you’ve rolled it out to the point where you can see crust peeking out from under all the way around the pan you’re good to go. Fold your dough in half then in quarters then move the dough to the pan and unfold, making sure you tuck the dough into the various edges of the bottom of the pan. Fold the excess dough under at the ledges and pinch the dough to create a decorated edge. 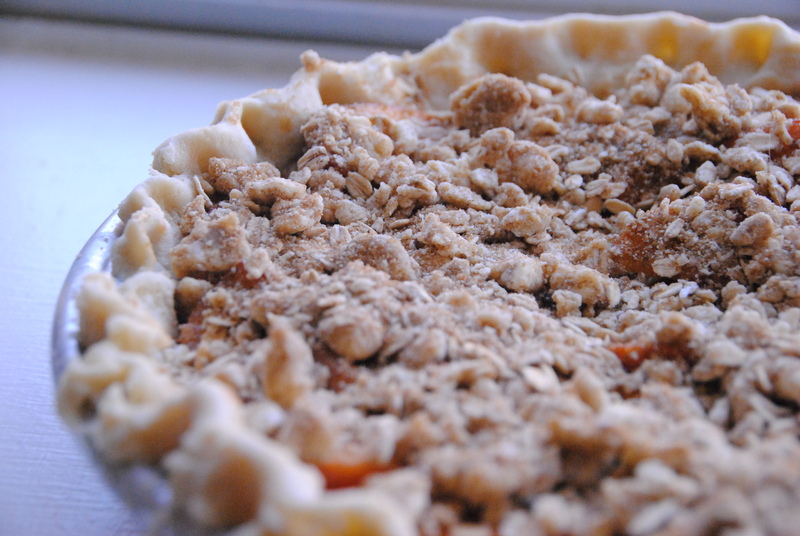 Stab the bottom of the dough with a fork to make sure there’s no awkward puffing, then put the pan back in the refrigerator until you’re ready to fill it with pie. To make the filling begin by preheating your oven to 375°F then simply toss carefully, with either your hands or a spatula, the peach slices, flour and brown sugar. To make the crumble topping mix the brown sugar, flour and oats together with your hands then work the cold butter pieces into the mixture until the pieces resemble small peas at the largest. If you feel yourself getting frustrated with the mixture clumping too much or just not getting any smaller stick the whole bowl in the freezer and relax for fifteen minutes or so. When you come back to the kitchen the butter will have chilled once more and the mixture will be much easier to crumble. 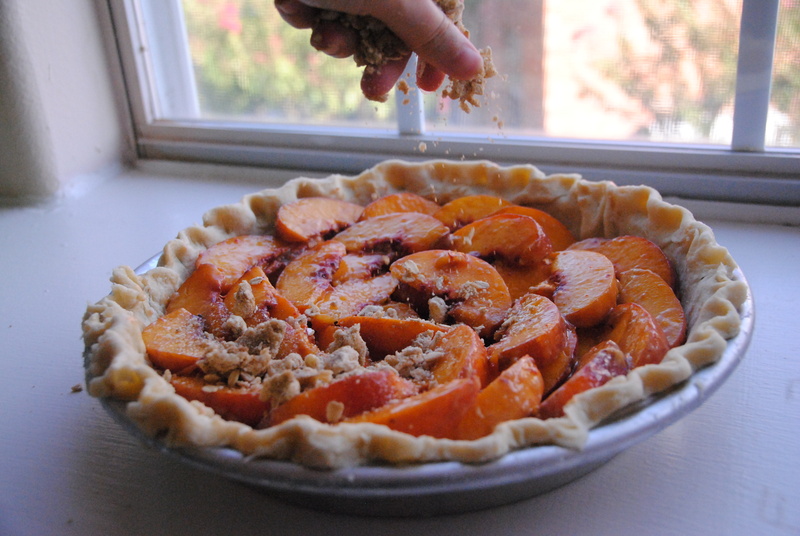 Now take the dough back out of the fridge, scoop your peaches into the pan (or you can carefully arrange them in a neat circular pattern) then sprinkle the crumble over the peaches evenly. 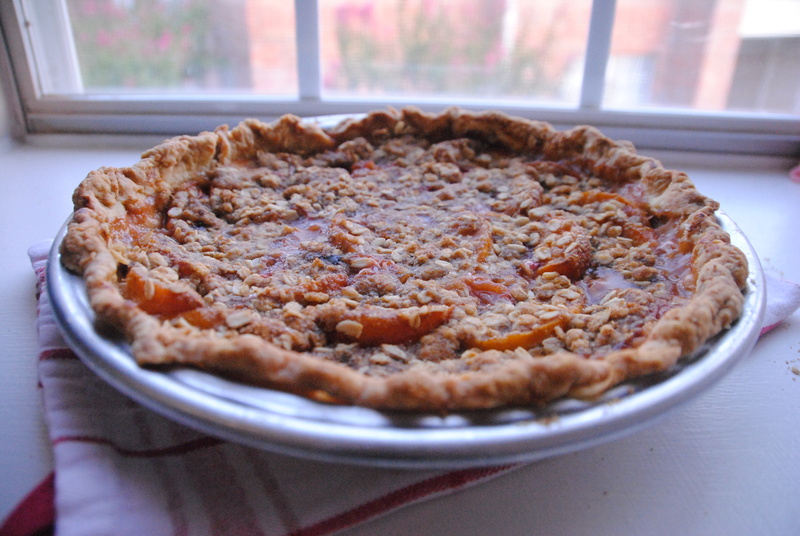 Place the pie in the oven and bake until the crumbles are golden brown and the peaches are bubbling, about an hour to an hour and fifteen minutes. Remove pie from oven and let cool for a couple of hours before diving in. This entry was posted in Desserts and tagged Desserts, Pie. Bookmark the permalink.